Identifying erosion problems is the basis for maintaining and improving water quality. Erosion brings soil and the nutrient phosphorus into waters that can cause sedimentation and algal growth- two major causes of water quality declines. Remediating these sites is paramount to preserving water quality and possibly improving it in the future. However, erosion sites are numerous and watersheds are vast. Finding all of these sites can be a costly and time consuming process. Last summer LEA started an ambitious project to improve erosion surveys: using mobile phones. We piloted this project in Bridgton, and have created a guidebook to help other groups replicate this novel method. Traditional surveying techniques required a GPS, camera, maps, and lot of paper forms. Fortunately, technological advancements have made all of these available in the palm of a hand. Modern cell phones have GPS location, cameras, and the ability to fill out and upload forms all in one device. Having all of these tools available together makes surveying much faster and simpler, and the device is always at hand! The data is automatically uploaded and immediately available, unlike with paper forms that have to be tediously transcribed. This new method of surveying saves time, and frees up more funding remediation. Over last summer and fall LEA interns and staff gathered erosion data for all of the public roads in Bridgton Maine. Over 300 sites were identified on 66 roads throughout the town. This survey took weeks, but it would not have been possible without using mobile surveying. The data was compiled into a map that ranks the erosion sites on their severity and proximity to a water-body. You can see the map here. Click on sites to get more info and view a picture of the erosion. This map was also shared with the Bridgton Public Works department and will be used to help inform road work to alleviate these erosion problems. Survey Guide – Click the image to download a PDF of the guide! 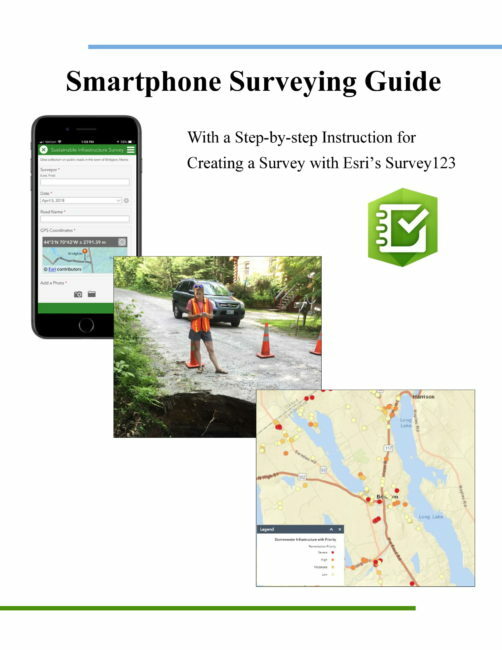 Because of the success of this program, LEA has created a guidebook on mobile surveying to help other groups replicate this survey method. Initially, the survey programs and platforms may seem complicated, which is exactly why we created this guide. We created this to be insightful and intuitive for both professionals and volunteers to use. The methodology can be translated into other programs besides erosion sites as well. Already staff at LEA has used these programs to create an algae monitoring survey with this method. This new way to survey is faster, more efficient and easier than current methods. Sharing this method will help protect water quality and progress scientific efforts on a statewide level. Download a copy of the guide by clicking the image to the left.